In 2003, Topps issued its first ever NASCAR cards via eTopps.com. Now, collectors holding these NASCAR cards in their portfolio can have them autographed by the driver as part of the eTopps Autograph Program. 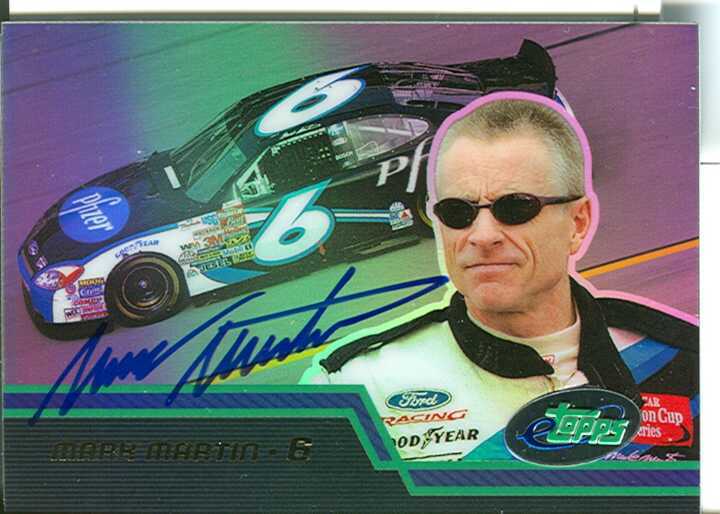 Mark Martin, a 23-year veteran and winner of the 2005 NASCAR NEXTEL All-Star Challenge, is the first NASCAR autograph subject offered and is available for $44 and limited to just 100 copies. All autographed eTopps cards are encased and stickered with an eTopps Autograph Hologram and come with an official Topps Certificate of Authenticity (COA). Each COA will include the sticker number that corresponds to the autographed card. Cards are automatically shipped to the buyer and not returned to the portfolio. eTopps maintains an online autograph database to verify the authenticity of the eTopps autographed cards.